There are days when after all the good food you've skimped on in favor of low-calorie, nutritious meals, you think you deserve to indulge. Yesterday for me was such a day. 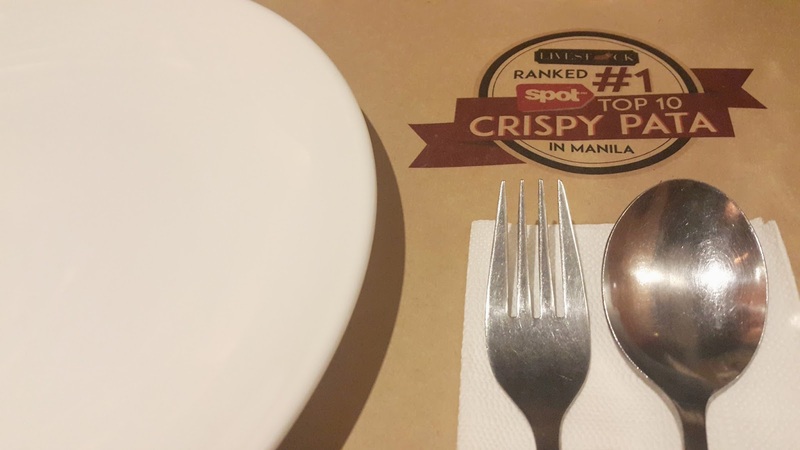 My friends Cams and Aika met another friend and former colleague Ava last night at Livestock, a restaurant that boasts being ranked first in SPOT.ph's 2014 Top 10 Crispy Pata in Manila list. Ava often holds business meetings there but it was the first time for the rest of us, so we had her recommend some dishes. 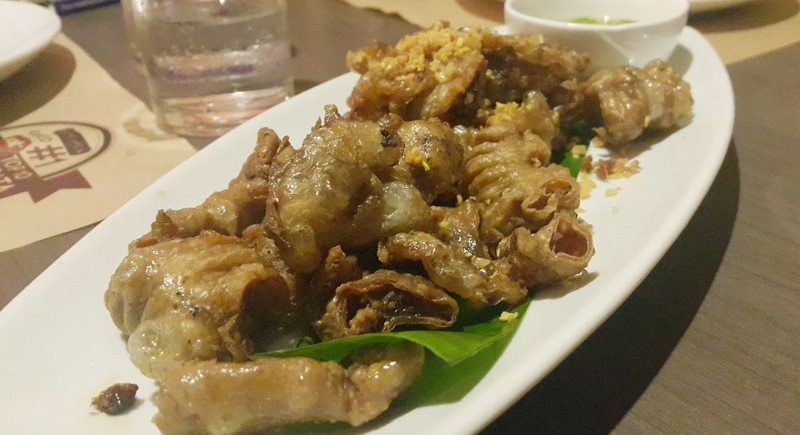 For our appetizer, Ava suggested Livestock's Chicharon 3 Kinds (crispy bulaklak, bituka or intestines, and chicken skin), which was bite after sinful bite of pork crackling goodness. 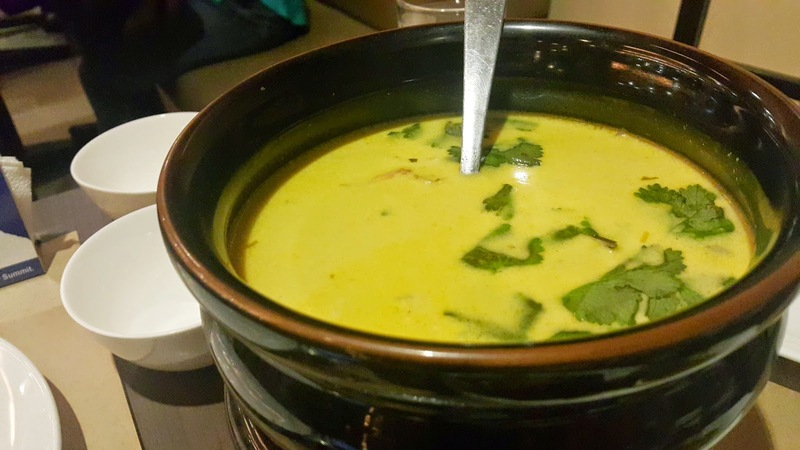 To warm our stomachs, we had Seafood Laksa Soup, which was adequately creamy and spicy. 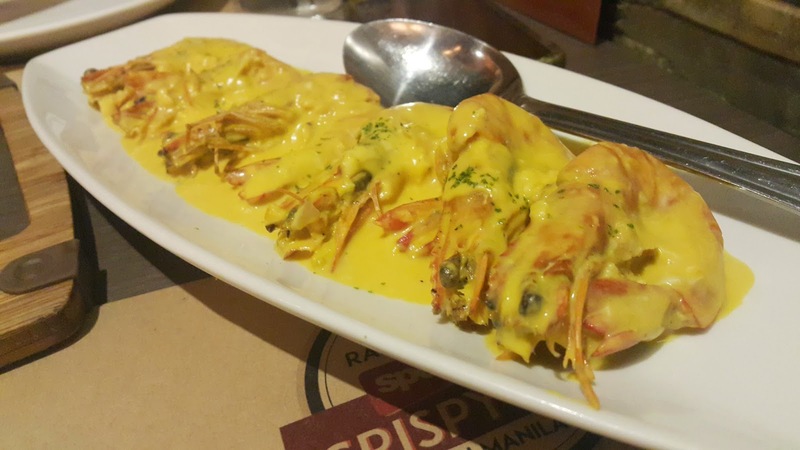 We also ordered their Salted Egg Prawns. I found it a bit redundant in itself because it was two kinds of salty in one dish, but it was good nonetheless. 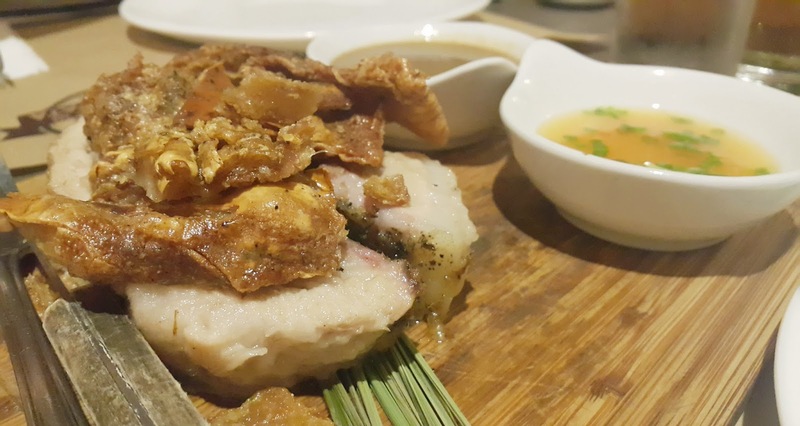 We had two pork dishes: the crispy pata, naturally, and another restaurant bestseller, the Livestock Crackling Pork Belly. You can have the latter in either a 300-, 500- or 1,000-gram slab, but we ordered just 300 grams. 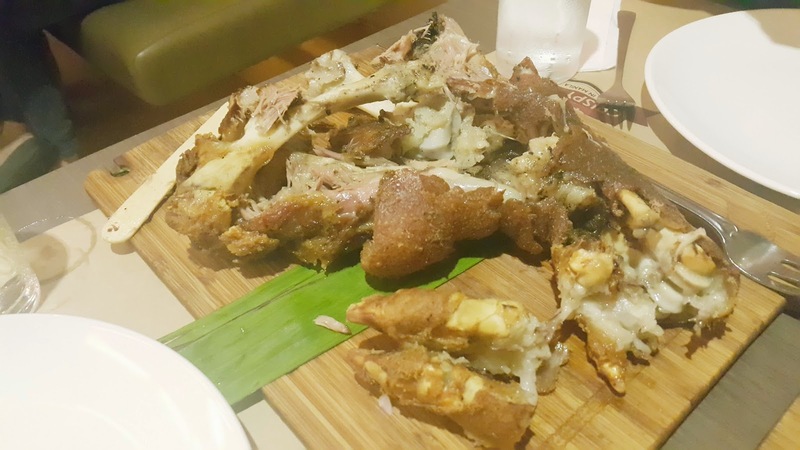 The crispy pata was so tender you can cut through it with a popsicle stick and fork, which was what our waiter did when he served it to us. 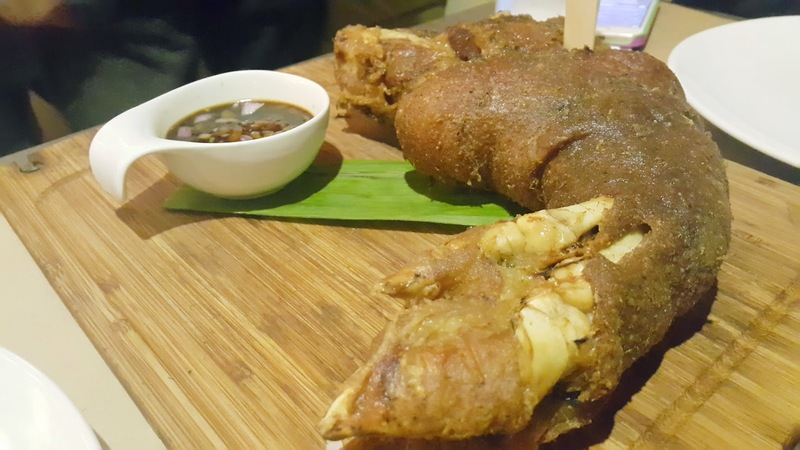 It wasn't a challenge to eat at all, and with its spicy soy sauce and vinegar dip it tasted even better (though I'm still partial to Serye's boneless crispy pata). Between the crackling pork belly and the crispy pata (and the three kinds of chicharon we just had), however, we already had enough fat molecules threatening to clog our arteries and making us light-headed, so we didn't even try finishing the crispy pata but had the leftovers wrapped in a to-go bag. Though Livestock is a great place to have drinks at, we went instead to La Vie Parisienne, a French bakery, deli and wine library at the ground floor of Hotel Rembrandt, only a couple of blocks away from Livestock. 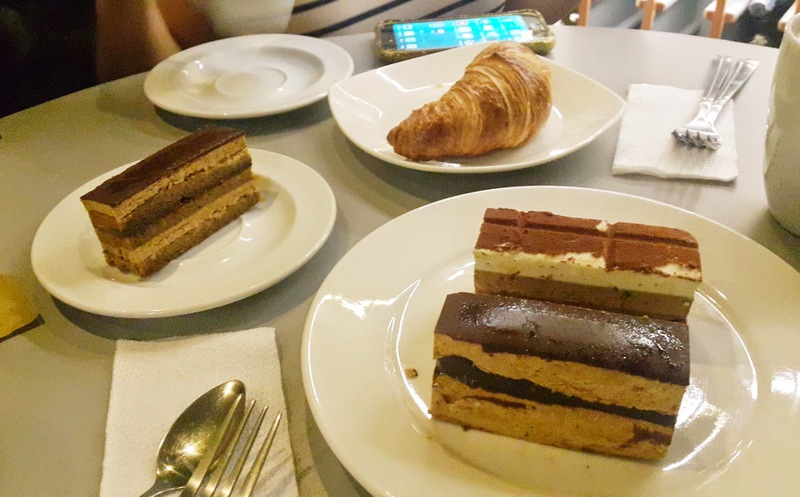 La Vie Parisienne offers a great selection of breads, pastries and wines, all for affordable prices, and you can eat and drink them inside at one of their four tables, surrounded by all their cellared wines. 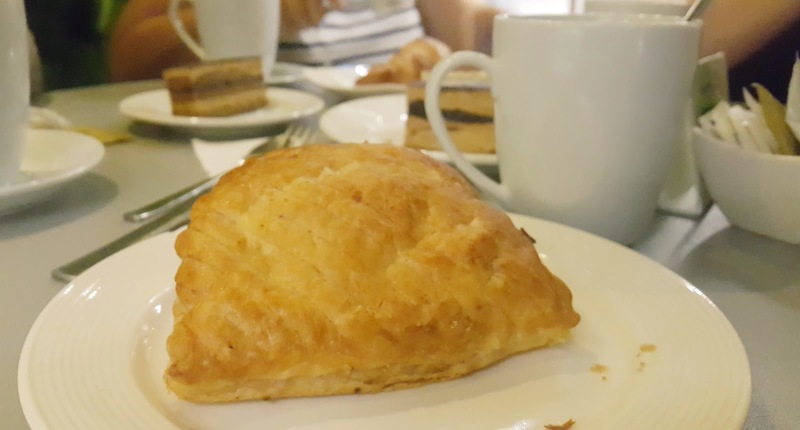 I ordered an apple turnover and a coffee, while my friends ordered three small slices of cake, a croissant, coffees of their own and some takeaway breads. Everything was delicious, especially the cakes, and the fruity sweetness of the Shanpelino sangria our waiter Gelo recommended later on was so addicting we had a hard time deciding to stop at just two bottles of it. (Ava and I brought home the empty bottles to use as home decor, along with a few other bottles the staff haven't thrown away yet.) It was a satisfying night of getting drunk in oil, caffeine, alcohol and good laughs. 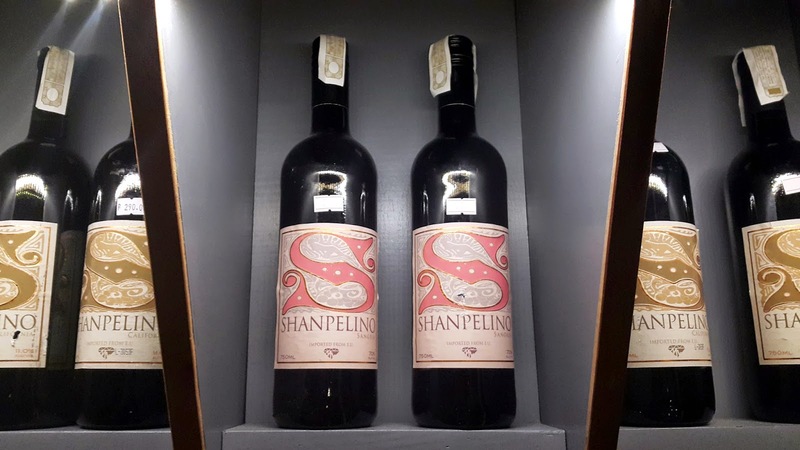 Shanpelino wines are cheap (P290/bottle), though they don't look like it. Livestock is a great place to commit the sin of eating fatty foods at, maybe even with a beer or four. It's at 34 Sgt. Esguerra Ave., South Triangle, Quezon City, and they're open from 11 AM to 2 AM. You can walk in and though there's sometimes a line to get a table, you don't have to wait very long. With La Vie Parisienne, on the other hand, you may have to call ahead to reserve one of their four tables if you plan to hang out. La Vie Parisienne is at the ground floor of the Hotel Rembrandt, along Tomas Morato Ave., Quezon City, and they're open from 7 AM to 2 AM. Visit them early to enjoy more freshly-baked breads and pastries.